No matter the sport, athletes are always looking for new ways to train their bodies. They need to continually shock their physiques with new routines that exercise muscle groups differently. Competitors do this to avoid workout plateaus that minimize their gains and stunt their physical performance. And while it comes as no surprise to habitual swimmers, most other athletes never really considered a pool-based exercise program. Swimming builds lean and longer muscles that pair with the shorter dense muscle groups targeted by weight training. The “swimmer muscles” are also great metabolism boosters that increase your ability to burn calories and fat. Plus, it is also wise to maintain proportional muscle groups to keep up appearances, because everyone can point out the guy who skips leg day. Heated pools can relax your muscles and improve your flexibility, which is important because it enables important muscular stretching. Exercises like running, cycling, and other similar endurance workouts can lead to a build up of lactic acid in muscles after a training session. An easy swim after a workout can help flush out these muscle-tightening toxins and decrease your muscle recovery time. By using all the body’s muscles groups simultaneously, swimming helps build core abdominal muscle strength stronger and faster than most weight programs. Even though about 70 percent of the swimming motion involves upper body activity, the kicking motion is very important and helps engage your core muscles groups. Some pool workouts can isolate the kicking motion and strengthen your core by using flotation devices that support the upper body while you use a kicking motion to propel yourself forward. 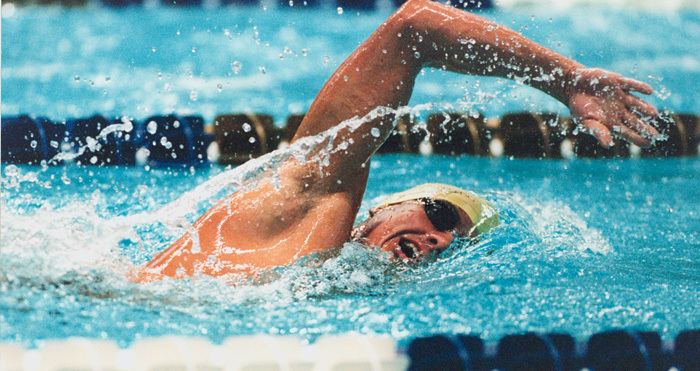 With the right technique, a swimmer can endure a much longer workout than in most other activities. Being able to train for longer periods of time allows you to burn more calories than say, a runner. So if you’re looking to burn calories more efficiently and have access to a pool, you should at least give it a try and test out the theory. The cardiovascular benefits aren’t the only advantages to a pool based workout. Most other exercise regiments involve high-impact activities that put your muscles and joints under a lot of stress. Sports like basketball, baseball, soccer, tennis, running, and weightlifting are higher impact activities that your body could use an occasional break from. By balancing your workout schedule with swimming exercises, your muscles and joints get the rest they deserve without sacrificing your daily training commitment. All you need for the pool is a swimsuit, towel, and some goggles if your eyes are sensitive. If you wear contacts or glasses there are alternatives to fit your vision needs such as prescription swim goggles that are surprisingly affordable. Don’t make the mistake of counting swimming out of your workout, because it is a great way to have a good time while improving your fitness results.